Sometimes the items featured here on Top eBay Chess Items by Price aren't at all something that interests me, but if it's related to chess, it gets its moment of glory. For this current post I would rather have featured an Irving Amen woodcut. Since the artist appeared a few years ago in Chess Art? Amen!, I went for a couple of dollhouse items. The item on the left, titled 'Vintage EUGENE KUPJACK Georgian SILVER Dollhouse MINIATURE CHESS BOARD SET', sold for US $558.88 after 24 bids from five bidders. 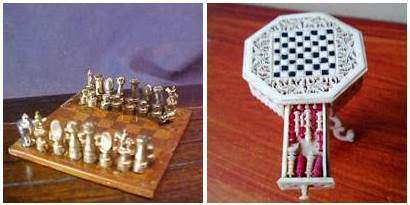 The item on the right, titled 'ANTIQUE NAPOLEONIC MINIATURE CARVED WOT NOT PRISONER WAR DOLL HOUSE CHESS TABLE', sold for US $600.00 after a single bid. Left: Selling a nice collection of hand crafted silver dollhouse miniature accessories made by the worlds foremost miniaturist, Eugene Kupjack. They are circa 1770s with a Georgian period style and design -- all solid silver with original rhodium plating to preserve the bright finish. This is an 18th cent. chess board set -- comes with a wooden checkerboard pattern game board and 31 chess pieces (1 missing, replaced with a little cup) the playing pieces include Knights on horseback. One set is tinted a copper color. All complete and intact with no excessive wear or damages -- some of the pieces were glued to the board and are still attached, others are loose. The game board is about 1 1/2" x 1 1/4". Cant find the EK mark. Great for a period dollhouse miniature diorama or room. Right: Superb & Highly Intricate Napoleonic Miniature "Wot Not". Wonderful Chess table, early 19th Century prisoner of war work miniature, ingeniously turned & carved from used camp soup & mutton bones with beautiful, pierced fret work panel doors all in perfect miniature & beautiful from any angle. Outstanding craftsmanship & incredibly intricate. The skill, patience & man hours required to create such an item from such humble materials is truly breathtaking. The entire piece is pegged & fixed by hand to ensure the pieces remain in position & they are still here to this day. The fret work pierced centre door opens & closes perfectly. The pierced, reticulated design, is again highly complex & intricate. Original finish throughout & a particularly fine, early example. 6 cm tall x 4.2 cm wide. ...Challenged by metric conversions? Then I guess you're not a dollhouse collector either (1" = 2.5 cm). As for the meaning of 'Wot Not', I'm baffled.